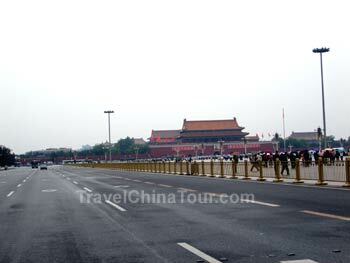 After I finished my Hutong Tour, I took a taxi and headed to Tiananmen Square in Beijing. Tiananmen square is located right at the center of Beijing city, and it is a symbol of confidence and self reliance of the Chinese nation - it's also one of the most famous tourist attractions in Beijing. Tiananmen Square is named after the gate tower located in its north, called the "Gate of Heavenly Peace". During the Ming and Qing dynasties, it was a forbidden area, and was surrounded by palace walls on all sides. When the Qing Dynasty was overthrown in 1911, lead by Dr. Sun Yat-sen, Tiananmen square became open to the public. Tiananmen Square is the largest public square in the world covering an area of 440,000 square meters, and it can accommodate up to a million people. Unlike most other cities in China, traffic flow and planning on Beijing streets (especially in the city center area) are very strict. For example, all around the Tiananmen square area, and infront of the Forbidden City, there are no parking spots, and no drop off or pick up zones for taxis. 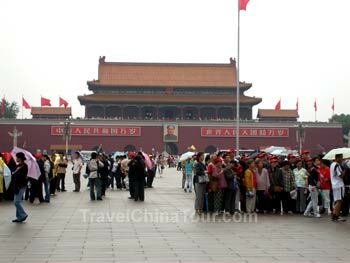 As well, the pedestrian traffic take an underground pass from the Tiananmen square to the Forbidden City. Because of this, my taxi driver had to drop me off a one of the side streets about 2 blocks away from Tiananmen Square, named QianHai XiJie. Which also happens to be where the Beijing Tourism bus station is located. Here you can purchase tour bus tickets that have various pre-planned tour routes in and around Beijing, typically costing $50 to $100 yuan I believe. However, these types of places are very crowded. Crossing a 6 lane road to get to Tiananmen Square. I took the above photo standing in the middle of a 6 lane wide road. Far in the back is the main entrance to the Forbidden City in Beijing, and to the right, past all the railings along the road side is Tiananmen Square. Photo of the Great Hall of The People. After I crossed the street, looking back to my left side (west) is the Great Hall of The People. See photo above. 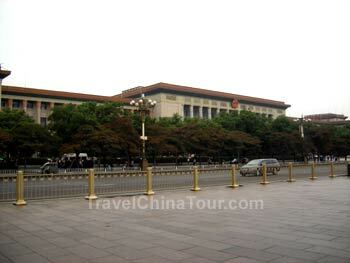 The Great Hall of The People was built in 1957, and covers an area of 172,000 square meters. This is the site of the China National People's Congress metting place, and also provides the location for other political and diplomatic activities. Monument of the People's Heroes and National Museum of China in the far background. 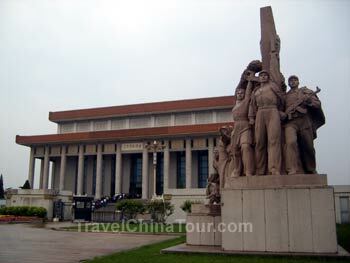 In the picture above, taken east facing, you'll see the Monument to the People's Heroes located at the center of Tiananmen Square, and further back, is the National Museum of China. The Monument (the tall, lone standing stone structure) was constructed from 1952 to 1958 - it was built in memory of thousands of martyrs who died for the revolutionary cause of the Chinese people. The monument is 37.94 meters high, and it's north face has the inscription "Eternal Glory to the People's Heroes". However, the area around the monument was closed off to the public. It maybe difficult to see in the photo above, but there's a long line up of people waiting to enter Chairman Mao's Memorial Hall. I've never actually been in there (it doesn't interest me to see dead people...), but I know that cameras are not allowed inside, and I believe you need to check in your bags before entering. Photo of the Forbidden Palace across the street from Tiananmen Square. Even on a rainy day, there's still a large crowd. 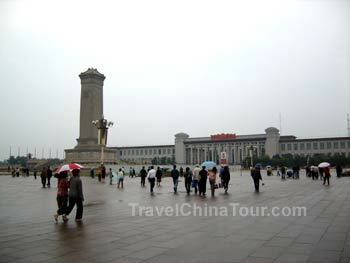 By the time I finished touring and taking photos of Tiananmen Square and its surroundings, my camera was out of battery! I was planning to tour the Forbidden city right after Tiananmen Square (just across the street! ), but unfortunately, I had to head back to my hotel to recharge the battery. After lunch, I was back at the Forbidden Palace by 1:30pm.